Fournier Forgery Album. No. 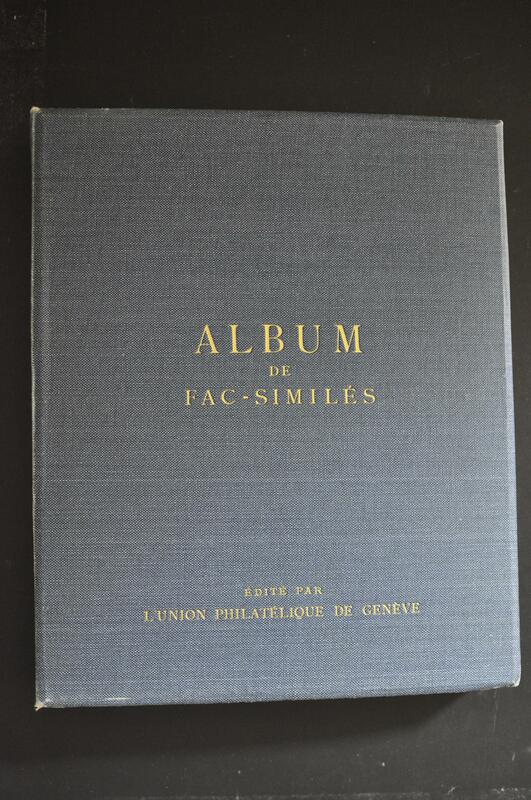 138; the celebrated volume containing approximately 3,000 "unused" and "used" singles and multiples plus an array of surcharges and cancels, complete but for a few empty spaces, in blue binder with "Album De Fac-Similés Edité Par L'Union Philatélique de Genève" in gold on front cover, an "EX LIBRIS" bookplatye inside front cover and a previous owner's address stamontitle page, binding and pages intact, Very Fine and desirable volume of which only 480 were produced and of which very few remain intact as many of the books have either been divided into country groups or had items removed. White, R.H., "Encyclopedia of the Colors of United States Postage Stamps", Vol. I-IV complete in four binders with slipcases, published by Philatelic Research Ltd., almost as new, dedicated to Dr Searing and autographed by the author on the title page, a very popular and sought-after reference work.